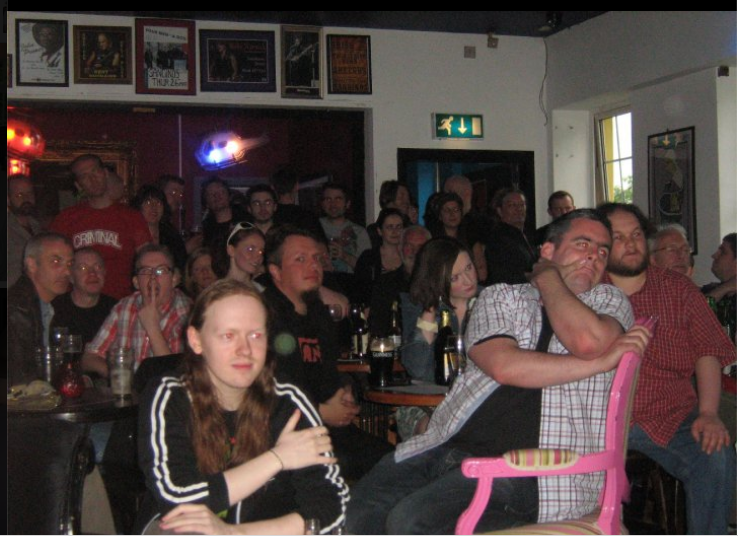 Following on from last week’s report, the indie comix tour picked up at Sandino’s Bar in Derry for the fourth annual 2D Festival in Derry, NI. Or rather outside the bar. The pavement has some seating (and twenty kegs), and as 2D “raises the bar”, each year the street fills further. This was pretty much the end of my getting any more professional revenue from the 2D Festival 2010. The rest of the evening was spent having mystomach operated on watching Mark Stafford dance like a Baachanalite pro. Conversing with Phil Barrett, Paddy Brown, Ger Hankey and Aiden, the editor of Irish language comic, Ri-Ra. I’d managed to drive all but Phil away, spreading my arms over the back of the dumpster, beckoning for a fight. After Phil had calmed me down on the mob’s behalf, Ger and Aiden returned. The conversation led to the importance of the Transformers comic in our growing up. (Ger Hankey is the quintessential Transformers professional: his portfolio captures the height of it’s powers: sign up someone!) Every week, we were delivered a cultural injection of action adventure morality in original narrative and cosmic art. Lew Stringer is the artist behind Brickman, The Suburban Satanists, Robo-Capers and Combat Colin. The latter two ran in Transformers, and Stringer’s pieces apppeared in most of the 332 issues of the series. So Aiden theorised that the comic’s success was due to him. Redeeming myself, I agreed that Lew’s work formed a central part of this generation’s cultural consciousness. comic through UK newsstands, he’d earn his current attention. But where was Lew Stringer in all of this? 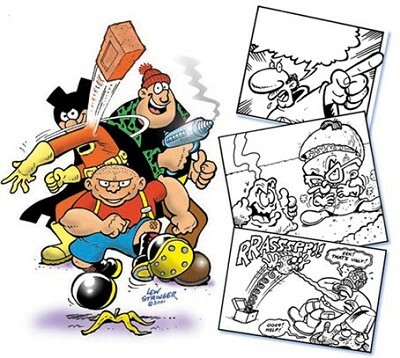 How could we, one mankind, united brother to brother and sister by Lew’s good works, have a regular British comic without content from Lew Stringer? So, I staggered to the hostel, and created a petition, and fell asleep. I figured this was the kind of thing to do while drunk. Saturday of 2D is sales and signings day. I had the misfortune to have my white and black comics in the corner beside the good chaps at Comics and Collectables, the Derry comics store. My booklets seem to take on a blank space and serve as Coca-Cola bottle coasters for the under-14s. Sales were slow, though this was going around. New stock for the Belfast market was acquired including Tommie Kelly’s From Rags to Rockstars, and two new Something Wonderful mini-comics, which gave the chuckles. In the evening, food at a fancy meat joint with Barrett, Brown, Maeve Clancy and a few others. We returned again to Sandino’s, as full as my stomach. I had a pleasant chat with Glenn Fabry about mutual acquaintances and locality. However, the rest of the evening was a blur and I left early for the comfort of the hostel. My 2D experience this year was a downer. Feelings of depression, inadequacy, missed opportunities and hangovers. By the end of it, I was shattered and giving serious thought to my future with comics. As it has been turning out, this was fundamentally a good thing. Everyone I spoke with about the event volunteered they had a fantastic time. The organisers, David, Ciaran and other creatives handled with a professional respect that should be the envy of many. (I’m told Chief runner David Campbell had become a father only weeks beforehand, which makes this ADDED WINS.) Our sincerest thanks to the team for a great weekend. 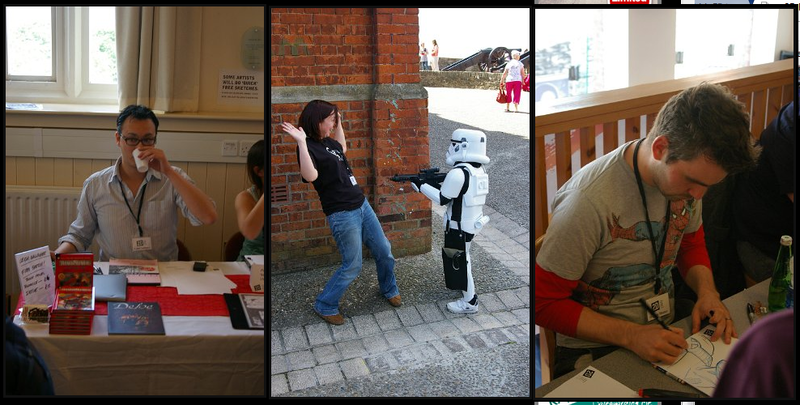 If you would like to read some more about the event, check out Aaron ‘Ron’ Abernathy’s report for Culture NI on “the most relaxed’ comic con festival around”. There’s also some great video footage from the event. Ah, but I’ve over-run my word count. Look out for Part 3 over the next few days as the tour moves from Derry to Belfast to Dublin and back.